The 7th and 8th of March are going to be excellent days for Porsche collectors. In concurrence with the Amelia Island Concours, RM and Gooding will together be auctioning off a total of 19 significant vintage Porsches. The two-day Amelia Island sale, held in the terrific early spring weather of beautiful Northern Florida will play host to a large variety of beautiful and exciting exotic and classic cars. There are racecars, supercars, exotics, and number of other rare and valuable Porsches. From those 20 Porsche lots, we selected and showcased our favorite on Wednesday. Today, we have whittled down a list of the top five most significant cars in attendance. We will also briefly discuss the rest of the Porsche lots. There are some excellent lots available at this auction, and if you have the ability to attend, you really should. The first of two Porsche Daytona 24 hour winners for sale, this 907 was the first Porsche to ever take a 24-hour overall race victory, and led home a Porsche 1-2-3 in 1968. The longtail bodywork that was fitted to the Porsche Works Team cars in 1968 was notoriously slippery and achieved very high top-speeds with relatively low power output, but they were also notoriously difficult to drive. Following up on the Daytona win, #005 also took a class win at the Monza 1000 Kilometer race in March, placing second overall behind a John Wyer Ford GT40. It did run at Le Mans in 1968 in the hands of a privateer, though suffered a DNF. For 1969, the car was fitted with more stable short-tail bodywork and returned to Daytona. A collision took the car out at the 24 hour, but it was fixed in time for the 12 hours of Sebring, where it finished highest of the privateer cars behind a GT40, a Ferrari 312P, and a factory-effort Porsche 908. In early 1970, the car was sold to the Wicky Racing Team of Switzerland. While the car had been raced with a 2.2 liter flat-eight for the Prototype 3.0 class earlier in its life, Wicky decided it would serve them better in the P2.0 class, and installed a 1991cc type 901 flat-six. Andre Wicky's strategy worked, as the car took class victories at Monza twice, the Nurburgring, and even Le Mans in 1971. The team continued to run the car through 1973 with some degree of success before retiring it. The car was restored to its Daytona Winning bodywork and livery, and refitted with a correct eight cylinder engine. Recently, the car was awarded "most historically important race car" on the field of the 2011 Amelia Island Concours, and was also invited to participate in the 2012 Daytona 24 hour 50th anniversary celebrations, where I was privileged to see it back running on the high banks. A truly significant part of Porsche's history, and a car that has competed against the best of the world with drivers like Elford, Stommelen, Siffert, Herrmann, Neerspasch, and Larrousse aboard. Pre-auction estimates place this car between 3.5 and 5 million dollars. I would not be surprised at all to see it surpass those numbers. This is a car that has a class win at Le Mans, and an overall win at Daytona. It doesn't get more significant than that. This is an interesting lot brought by Gooding. RSK 718-023 was previously sold at Gooding's 2013 Scottsdale auction just last January for a smidgen over 3 million dollars. Sold to Roy Schechter in the United States via the Sonauto dealer in France, the car was among the last RSKs built in 1959 before the specification change to RS 60. It's racing life was relatively short lived, running only through the end of 1960. As soon as he took delivery, Schechter shipped the car off to the Bahamas for the 1959 "Speedweeks" event, and did a respectable job for a privateer entry, but took home no laurels. From there, the car was primarily run with the Sports Car Club of America, taking an FM class victory in November of 1959 at a small half-mile track in Courtland, Maryland. After that, the car spent a lot of time on the podium, but would fall just short of the win. The car is reported to have its original engine, wears its original Wendler bodywork, and has been dubbed "one of the most correct and original RSKs in existence". In the early 1980s, March engineering developed a chassis for BMW to use in Group C and GTP racing, which was dubbed the M1C (also known as the March 81G). The BMW program was plagued with failures, though it did show some flashes of brilliance when they could keep it running. After BMW pulled out, March hired a young engineer named Adrian Newey to design the 82G for 1982. Without BMW engines to fit in the back, March simply sold chassis to privateer teams, who could then fit them with Andial built Porsche flat-six turbo engines, or Chevrolet V8s. Further updates were made to the chassis, and for 1983, five March 83G were produced. Of the five cars built, Holbert Racing purchased three of them with which to contest the 1983 IMSA GTP series. Holbert fitted 83G-4 with a 2.6 liter Porsche turbo unit, and won in its debut at the Charlotte 500K. A turbo failure at a non-championship Mosport race left them with a DNF, but they rebounded to win the Sears Point 3-hour race in July with a brand new 3.0 liter Porsche turbo engine. Success continued at the Portland 3-hours race, winning yet again. Another poor showing at Mosport, this time in the GTP 6-hour race, gave them a 7th placed finish. Another DNF at Pocono in Pennsylvania had the team frustrated, but still optimistic. Finishing the season on a high, Holbert teamed with Jim Trueman for a win at the Daytona 3-hour finale race. As the dust cleared, Holbert Racing had won the 1983 IMSA GTP championship, and their March-Porsche served them relatively well. At the end of 1983, Holbert's March was sold to a small team from South Africa, known as Kreepy Krauly Racing. 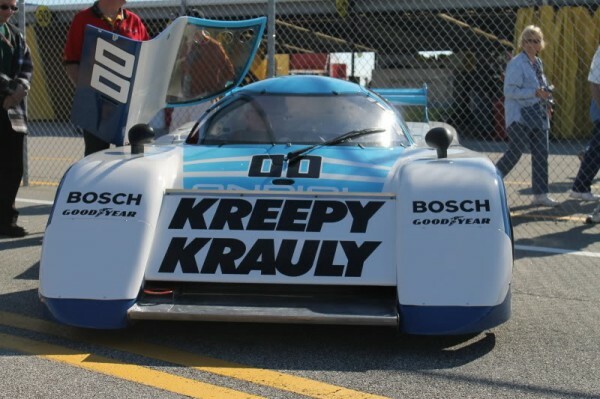 The Kreepy Krauley is an automated pool-cleaning tool, and they were looking to gain some notoriety in the United States by running an IMSA GTP team. Being based in South Africa, the Kreepy Krauly team hired three South African drivers to pilot their car for the season opening Daytona 24 hour. With a new 3.2 liter Andial-built Porsche engine behind them, Sarel van der Merwe, Graham Duzbury, and Tony Martin took to the grid on outside pole. The quick car proved nearly faultless, and carried them to an overall victory, 9 laps ahead of Preston Henn's Porsche 935L in second place. The remainder of the 1984 season was not quite as kind to the Kreepy Krauly team, as they suffered two DNFs, and only one other victory at Lime Rock Park. After they had finished with the car and withdrawn at the end of the season, the car was shelved for the entirety of the 1985 season, returning only in 1986 under the Wynn's Hotchkis Racing banner. Hotchkis managed a top-10 result at the Riverside 6 hours, but suffered DNFs at Daytona and Sebring. The car was restored to its Daytona winning livery, and currently houses a 3.2 liter Turbo engine. Like the 907 above, this March was invited to participate in the 2012 Daytona 24 hour 50th anniversary celebrations, and it was an honor to be able to see it run again. Another Daytona winner for Porsche, not to mention the 1983 IMSA GTP championship winner, and certainly a significant car for March, this one should sell well at just under the million dollar mark. If you are looking for a winning car, and a significant car, for a relative bargain, then this is your car. The only thing you need to know about this car is the option code "M471". M471 is Porsche's internal code that essentially means "homologation special", which had very few pieces applied that were not necessary. This car was the lightest, most race-ready Porsche that they made at the time, and is rivaled only by the 911R for competition prowess. Only 240 such examples were built, and very few can match the level of originality of this particular chassis. This particular car features a matching numbers engine and transmission, and all original Bosch mechanical fuel injection. This RS was originally delivered to a German owner, and has changed hands through collectors for several years. Built in the "second run" of 2.7 RS cars, this car is unique in its completeness and originality. The car was previously sold through Bruce Canepa's shop in California, and they feature several highly detailed photos. From these photos, you can easily determine how immaculately clean the car is, and also see some of the unique features of an M471 car. For example, look at how little paint or undercoating is featured on the underside of the car. Gooding has placed a pre-auction estimate on this car somewhere between 900,000 and 1.1 million. If this car does, in fact, reach the 1 millon mark, it will be the first publicly offered production 911 sale north of that number. If there is any 911 worth a million dollars, it is probably this one. After the success of the last "Vorserie" 959 that RM Auctions sold in Monterey, they have signed up a second pre-production car for sale at Amelia. Porsche produced 21 of these"pre-series" cars for certain executives of the company. This car was used for demonstrations through 1989. After production started, this car was completely rebuilt by the factory to upgrade to production-spec Komfort trim. This is a two-owner car, and has been documented and serviced by Porsche since it left their care. The car shows to have only been driven about 10,000 kilometers since the rebuild in 1989, and this is shown in how immaculate and original it is. This 959 features tri-color sport seats, factory retrofit air conditioning, and unusually rare hood-mounted driving lamps. RM has placed this car at a pre-auction estimate of $575,000 - $725,000. Knowing 959 values, it could easily exceed that. Other Porsche Lots Featured By Gooding & Co.
Auction preview photos provided by their respective auction houses. 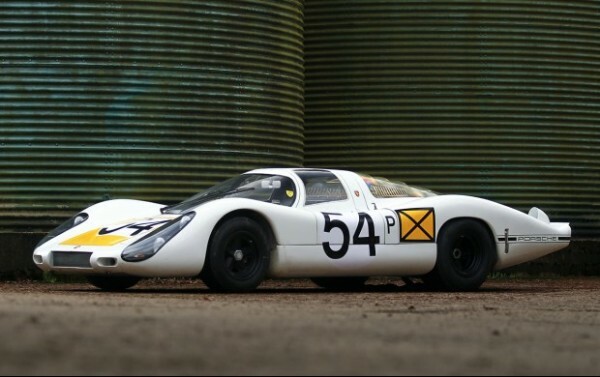 Porsche 907 Daytona 1-2-3 victory photo provided by Porsche. Daytona 50th anniversary celebration photos ©2014 FLATSIXES.com/Bradley Brownell, all rights reserved.